Language rifts in the Balkans are endemic and have long been both a symptom of ethnic animosity and a cause for inflaming it. But the break-up of the Serbo-Croat language into four mutually unintelligible languages within a decade is, by any previous standard of linguistic behaviour, extraordinary. Robert Greenberg describes how it happened. Basing his account on first-hand observations in the region before and since the communist demise, he evokes the drama andemotional discord as different factions sought to exploit, prevent, exacerbate, accelerate or just to make sense of the chaotic and unpredictable language situation. His fascinating account offers insights into the nature of language change and the relation between language and identity. 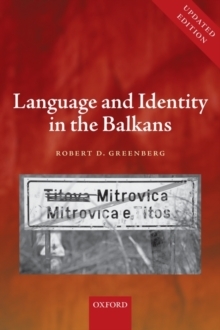 It also providesa uniquely vivid perspective on nationalism and identity politics in the former Yugoslavia. The new in paperback edition of this award-winning book includes new material covering the significant developments in the region since the book's first publication in 2004.